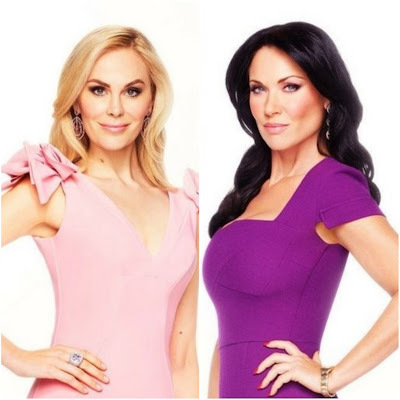 iRealHousewives | The 411 On American + International Real Housewives: Kameron Westcott And LeeAnne Locken Reflect On The Real Housewives Of Dallas Drama And Tease About Upcoming Third Season! Kameron Westcott and LeeAnne Locken recently spilled all the tea about The Real Housewives of Dallas. The two socialites reflect on the drama and tease about the upcoming new season and much more. Check it out below! Westcott opened up how she ended up on RHOD. "I am still not quite sure! One minute I was driving my kids to school and the next I have a camera in my face when I am flossing my teeth, she told D Magazine. Joking aside, I knew Cary Deuber, and she told the producers about me, and after months of debating of whether or not to do it, I decided that you only live once. I knew that I was more likely to regret not trying then putting myself out there." However, the blonde beauty in pink revealed that her co-stars was what surprised her the most. "My cast mates! Going in, I knew that Dallas had strong women and strong personalities, but Bravo did a great job rounding up the cream of the crop," she said. "I never know what is going to happen next on the show, but that’s what makes it great television. The other housewives are always catching me off guard, and somehow things always start normal and end up wild." So what did Kameron enjoy the most about being part of the show? "Besides being able to use the platform to help spread Susan G. Komen’s message and help dogs eat fabulous food, my other favorite part of being on the show is getting to connect with other women through social media that are as obsessed with pink as I am," she explained. Kameron hopes viewers embraced the community and city of Dallas, just as she did. "Dallas is a classy, first-rate city filled with real, hard-working, charity-driven people that deeply care about their fellow citizens and community, and who are not afraid to laugh at themselves." As you may all recall, Westcott did a pink dog food line called SparkleDog, which proceeds goes to the Susan G. Komen foundation - the reality star and mother-of-two explains why it was important for her to partner up with them. "My childhood best friend was diagnosed with breast cancer two years ago, and I saw firsthand how hard the whole process is. I then did some research and found that 1 in 8 women will be diagnosed with the disease, and that every 60 seconds someone dies from breast cancer," she told D Magazine. "These alarming stats made me realize that we have to find a cure, because it affects everyone. After I developed SparkleDog, I knew I wanted to tie in a charity, and since Susan G. Komen is headquartered in Dallas, it only made sense for us to partner." Meanwhile, Locken admits she has no regrets about RHOD. "Not really, she told Guide Live. "If we regret what we go through, then we can't appreciate where we're supposed to be." Does the mouth from the south want to see certain cast members gone from the Bravo hit reality series? "No, I'm not that person. I'm not intimidated or afraid to film with anyone," she explains. "Do I think that some of my Housewives would love to see me gone? Yeah. ... But you know what? I think, in the end, that's an immaturity." LeeAnne then teases about Season 3. "Let's hope!" she says after being asked if the show was returning for a third season. "It's a definite maybe." Even if she knew, Locken wouldn't tell becuase Bravo "has good lawyers," she says.